An Address on Intemperance Delivered Before the Temperance Society of Cumberland County, Pennsylvania. Carlisle, PA: Printed by George Fleming, 1830. Protestant denominations in the United States, and in the colonies before that, were well known for their stand on sober and pious living. Benjamin Rush, the Philadelphia doctor and devout Presbyterian, had, for example, designed his own "Moral Thermometer" which measured the extent to which one's level of righteous living fell below or exceeded standards. His 1784 pamphlet An Inquiry into the Effects of Spirituous Liquors on the Human Body and Mind laid out medical questions on distilled alcohol use but praised beer, wine, and cider as beneficial to health. In the following years, the distillation of alcohol and its consumption exploded with per capita consumption in the first decades of the nineteenth century triple that of late twentieth century America. Despite sporadic efforts like the pioneering 1808 Temperance Society of Moreau and Northumberland Counties in New York, organized moral efforts against drink were largely unsuccessful. This began to change on February 13, 1826, when well known clergymen Justin Edwards (1787-1853) and Lyman Beecher (1775-1863) helped found in Boston the American Society for the Promotion of Temperance, known popularly as the American Temperance Society. Taking advantage of the infrastructure of the various existing churches and their pastors, the Society within five years claimed 6,000 local organizations and 1.5 million members. Further unification of effort was achieved when a conference in 1833 produced a more tightly organized United States Temperance Union, called the American Temperance Union after 1836. Moral standards were tightening as well, as more and more organizations moved from a gospel of temperance and moderation to one of total abstinence from all alcohol, including beer and wine. 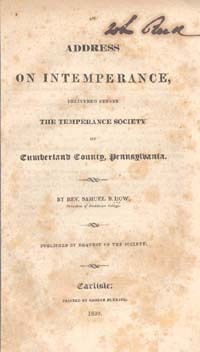 In this atmosphere Samuel Blanchard How, the newly appointed president of Dickinson College, a Presbyterian institution in Carlisle, Pennsylvania, spoke at length to the Cumberland County Temperance Society on July 5, 1830. The fact that the lecture was held in such a venue confirms the status of the local temperance movement. How begins his lecture with a call for morality to be at the center of life. He then outlines with statistical evidence the quantity of spirits being consumed in the United States at the time, noting, for example, that New York alone has 1129 distilleries. He then outlines what he sees as the causes of the attraction of liquor and the evils that flow from that it, such as poverty, infamy, crime, and ill health. At one point he quotes Benjamin Rush saying that few hard drinkers are able to survive yellow fever. "Everlasting perdition" is, however, the most certain and heinous result; the only road to salvation is total abstinence. He refuses to accept the argument of freedom of action in this case, even comparing the desire to drink and sell drink to murder, as evils that require self-restraint and even protective laws. He concludes his talk with the assertion that the current drive against alcohol compares with the Reformation or the abolition of the slave trade, as a "great and glorious effort." Andrew Carothers, a prominent Carlisle lawyer and chair of the Board of Trustees of Dickinson College, moved that the speech be printed and distributed as part of the battle against the moral evils of alcohol. One may argue from statistics that the temperance movement of the 1830s and 1840s succeeded since the consumption level of alcohol did drop off sharply to levels that have never been remotely approached again in United States history. Several states passed laws to limit their liquor trade during these decades. Interest in temperance also fell off, however, as other issues such as abolition took center stage; a full-throated temperance movement would not gather strength again till the latter part of the century. This later effort would culminate with the Eighteenth Amendment to the Constitution - a complete prohibition on the sale or consumption of all and any alcohol.